Switzerland - IOM reports that 351,080 migrants and refugees entered Europe by sea in 2016 through 4 December, arriving mostly in Greece and Italy, compared with 883,393 by this time in 2015. 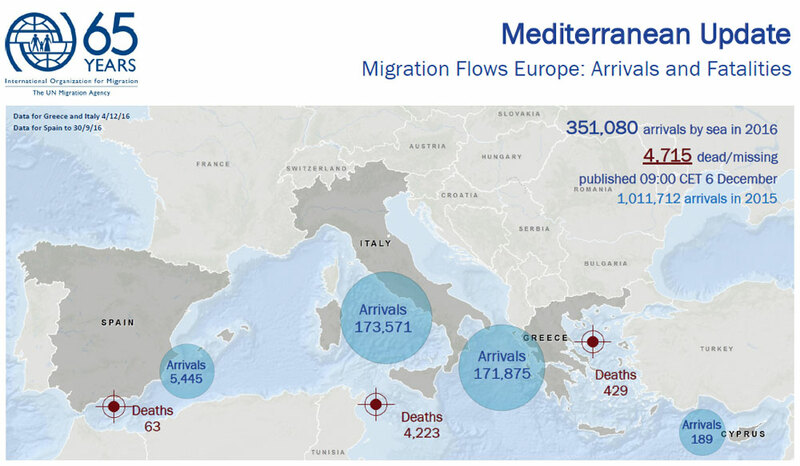 Some 173,571 people have arrived by sea in Italy and 171,875 in Greece during 2016. The total number of migrant and refugee fatalities in the Mediterranean since the beginning of 2016 is now 4,715. This is 1,148 more deaths than at this point last year, when 3,567 men, women and children were reported drowned through November 30. A total of 124 arrivals by sea were registered between 2-4 December on the Greek island of Lesvos. According to data collected by IOM staff on the islands, migrant arrivals in Greece by sea in 2016 have been approximately 42 percent adult male, 21 percent adult female and 37 percent children.